Linguine pasta with crab in a cream and tomato sauce topped with rocket and red chilli. Delicate wild caught crab and fiery red chillies in a creamy white wine sauce, with Italian linguine. To create a sauce that showcases the delicate earthy flavours of wild caught crab, our chefs combine velvety whipping cream, white wine and lemon juice with tangy tomato passata. 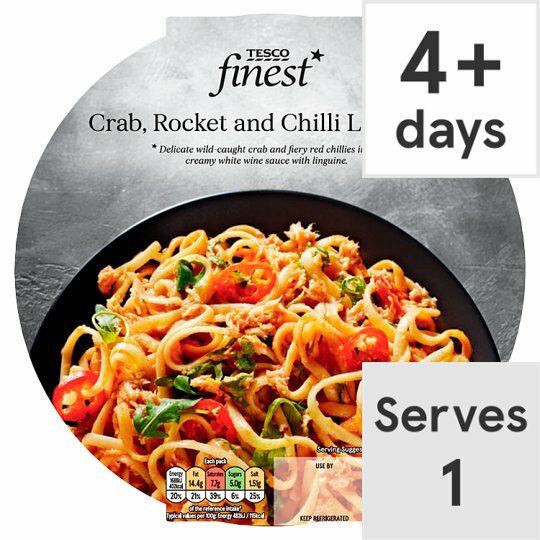 Peppery fresh rocket and the kick of red chillies add a spice contrast, while traditional bronze die linguine, with its rough texture, is perfect for clinging to the rich sauce. Cooked Pasta, Crab (Crustacean) (14%), Whole Milk, Whipping Cream (Milk), Single Cream (Milk), Water, Tomato Passata, White Wine, Rocket, Red Chilli, Cornflour, Lemon Juice, Garlic Purée, Salt, Parsley, Anchovy Essence (Fish), Carrot, Prawn Powder (Crustacean), Onion, Leek, Black Pepper, Acidity Regulator (Citric Acid, Acetic Acid), Sunflower Oil, White Pepper, Thyme, Bay, Fennel, Concentrated Lemon Juice. Not suitable for oven heating.